I decided to do the retro design i've been doing using the satin finish polishes by NYC and I don't think it turned out good at all! And I may have ruined it by adding the green dots but I couldn't resist not putting them in! They're somewhat good but still a fail I think! Not a fail at all. 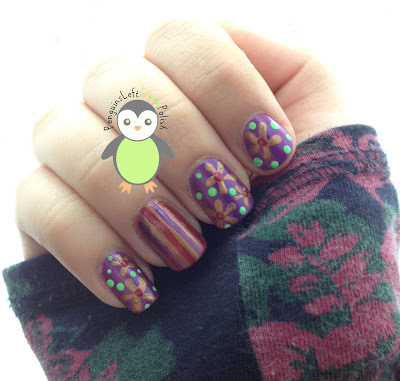 I only wish to be able to do nail art like you! Aww thank you :) You can do it! Your work is great! Overall this looks great, nice concept and the colours look good alongside each other. I think a thin stripe or 2 of the green on your accent nail would pull this together as it is such a vibrant colour and it is missing from that one nail. It looks just fine :-) totally matches your shirt!